MUSGRAVE GROUP IS extending its recall of electric blankets due to a continued fire safety risk. The group says that there are concerns that a manufacturing defect “may cause the blankets to spark or go on fire”. The two models affected are both ‘Daewoo’ branded and were sold at SuperValu and Centra stores between January and March 2018. For double-sized electric blankets those with the model number HEA1179 are affected by the extended, voluntary recall. For single-sized electric blankets the model number HEA1178 are affected. 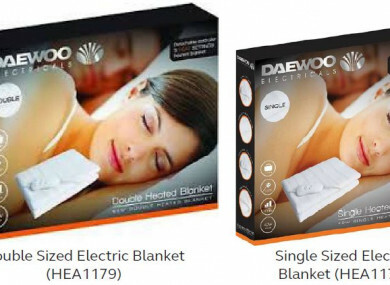 In a statement, the Competition and Consumer Protection Commission (CCPC) said that customers who own a Daewoo double or single electric blankets should try identify if theirs is one of the models affected. If your electric blanket is one of the affected models stop using immediately. You can return the product to the store where you bought it for a full refund. Email “Supervalu and Centra extend recall of electric blankets for fear they may catch fire”. Feedback on “Supervalu and Centra extend recall of electric blankets for fear they may catch fire”.